QPR have unveiled John Gregory as their new manager, with former boss Gary Waddock becoming first-team coach. Former Aston Villa boss Gregory, 51, returns to management three-and-a-half years after leaving Derby. Waddock replaced sacked Ian Holloway at the helm in February before getting the position full-time in the summer but has struggled since then. Gregory, joining with QPR bottom of the Championship, said: "I'm back in the hot-seat and it's a huge challenge." QPR have won just one league game this season and were knocked out of the Carling Cup by Port Vale on Tuesday evening. But Gregory, a close friend of Rangers chairman Gianni Paladini and a former player at the club in the 1980s, is looking forward to a daunting task. "QPR are very close to my heart and it's a fantastic opportunity for me," said Gregory, who reached the FA Cup final with QPR as a player in 1982. "This is a job I can very much get my teeth into and I'm relishing the challenge that lies ahead. He also told BBC Sport: "It's a club I was associated with for four-and-a-half years of my playing career - probably the most successful of my football career. Is Gregory the right man for QPR? "I won my England caps while playing for QPR - that kind of influenced to want to come here." Paladini revealed his delight at Gregory's appointment, saying: "It's a fantastic scoop for the club. "John is a proven manager at the highest level and is very eager to get back in to the managerial game. "He's sat down with Gary and talked everything through and the situation is perfect as we look to climb the Championship table. Waddock said: "It's the right decision for the club, I'm just thankful that Gianni thinks enough of me to keep me here as Assistant Manager. "I look forward to working with John, we both played together under Terry Venables and have the same work ethic. "I'll learn a lot from him and I'm sure that this appointment will benefit the club I love." Gregory began his managerial career at Portsmouth and he also had a spell at Plymouth. He took over at Wycombe Wanderers in October 1996, where he helped the team avoid relegation and remained in charge for two years. The former England midfielder took over at Villa in the 1997/98 season and during the four years under Gregory's management Villa never finished outside the top eight in the Premiership. 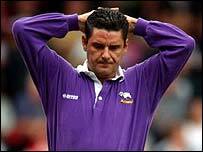 He has also managed Derby and has been out of management since leaving the Rams in March 2003.